The summer season is the best season to start any new project or to tinker around the house. While shaking the dust out of your home might be more associated with springtime, starting any form of home improvement is better done during the longer and drier summer days. A final coat of paint can make or break a small scale or large scale project. Therefore, it is vital that you take note of a few tips to ensure that you end up with a paint job that looks clean and professional. Listed below are some of the most popular tips for your next painting project. The greatest enemy of a wet coat of paint is humidity. Humidity can cause paint to take a much longer time to dry. It can also cause droplets to form on surfaces and make it difficult for the paint to adhere properly. Also, while the dryness of the summer season lessens the chances of sudden rainfall, there is still a possibility that a sudden shower could occur. Therefore, you should take the time to check the weather forecast before you apply that first coat. Ensure that there will be no sudden rain fall before, during, or immediately after you have finished your paint job. Otherwise, all your hard work could quite literally go down the drain. The best way to create an even finish is by prepping your chosen surface beforehand. This can entail sanding, filling holes or cracks, priming, and even a complete wipe down of the entire surface. Though the task might seem tedious, this valuable first step can save you the trouble of doing touch ups or even redoing the entire paint job due to an uneven surface area. Likewise, preparation includes your immediate work space and the surrounding area. Regardless of whether you are working indoors or outdoors, make sure that you have protected all of the areas that you do not want to paint. 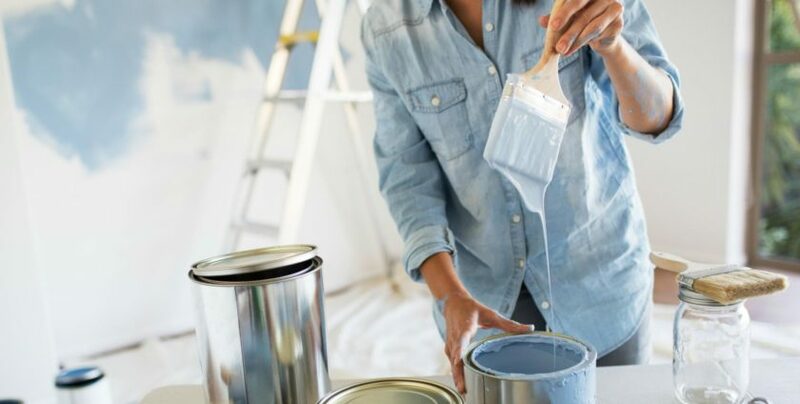 Though the paint prices might initially seem too steep for a simple painting project, high quality painting materials and painting accessories and tools can truly make a huge difference. If possible, consult with the hardware store owners or assistants and ask for their recommended products. Tale the time to choose the best quality rollers, painting brushes, tape, and paint. The investment might seem unnecessary at first, but it will pay off in the end. After all, you will be spending much less on repainting and touch ups if you already have a good start. Likewise, you will be able to use the more durable quality painting brushes for future painting projects.